Yossi Beilin is back. This unrepentant Israeli “peacemaker” is like the mythical phoenix, constantly resurrecting from its own ashes. In a recent article in Al-Monitor, Beilin wrote in support of the idea of a confederation between Israel and Palestine. A confederation “could prevent the need to evacuate settlers and allow those interested to live in Palestine as Israeli citizens, just as a similar number of Palestinian citizens could live in Israel,” he wrote. Bizarrely, Beilin is promoting a version of an idea that was promoted by Israel’s extremist defense minister, Avigdor Lieberman. The difference between Beilin and Lieberman is in how we choose to perceive them. The former was the godfather of the Oslo Accords 25 years ago, a well-known political “dove” and the former chairman of the “left-leaning” Meretz party. Lieberman, on the other hand, is purportedly the exact opposite. 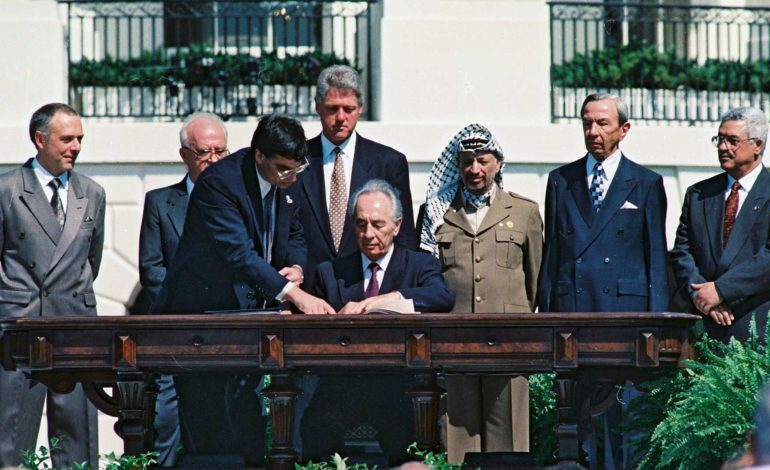 That is the brilliance of Beilin, his followers and the whole “peace process” that culminated in the Oslo Accords and the famous White House handshake between the late PLO chairman, Yasser Arafat, and the late Israeli prime minister, Yitzhak Rabin, in September 1993. They successfully branded this hideous infringement on international law as a sincere effort at achieving peace between two conflicting parties. But Oslo will not go away. It remains a problem because the intellectual foundation that led to its conception is still firmly in place — where only Israel matters and the aspirations of the Palestinian people are still inconsequential. While Beilin is no longer an influential politician, there are many Yossi Beilins who are still lurking, playing the role of “peacemakers”, meeting behind closed doors, on the sideline of conferences, offering their services as interlocutors, wheelers and dealers, and saviors. The late Palestinian professor, Edward Said, was not prophesying when he warned of the disastrous future consequences of Oslo as it was being signed. He was dismissed by mainstream media and pundits as radical, lumped with the other “enemies of peace” on “both sides.” But, he, like many other Palestinians, was right. “Labor and Likud leaders alike made no secret of the fact that Oslo was designed to segregate the Palestinians in noncontiguous, economically unviable enclaves, surrounded by Israeli-controlled borders, with settlements and settlement roads punctuating and essentially violating the territories’ integrity,” he wrote in the Nation. The colonization of Palestine, for the first time, was accelerating with the consent of the Palestinian leadership. The PLO was turned into a local body with the inception of the Palestinian Authority in 1994. The rights of millions of Palestinian refugees in the diaspora were relegated. The West Bank was divided to areas A, B and C, each governed by different rules, mostly under the control of the Israeli military. The “Palestinian revolution” turned into an agonizing process of “state building”, but without state or even contiguous territories. Palestinians who rejected the horrific outcomes of Oslo — protracted expansion of Jewish colonies, continued violent occupation normalized through “security coordination” between Israel and the PA — were often abused and deemed extremists. The PA played along because the perks were far too lucrative to be abandoned on principle. A new class of Palestinians had risen, dependent on Oslo for its wealth and affluence. Even when the Trump administration cut off the Palestinian Refugees Agency, UNRWA, of all funds and scrapped the $200 million in humanitarian aid to the PA, the U.S. still released $61 million dollar to the PA to maintain its “security cooperation” with Israel. “Israel’s security” is just too sacred a bond to be broken. This is why Oslo remains dangerous. It is not the agreement itself that matters, but the mindset behind it — the political and diplomatic discourse that is wholly manufactured to serve Israel exclusively. In January 2017, Daniel Pipes of the pro-Israel Middle East Forum came up with what seemed like a puerile idea: A “way to peace” between Israel and the Palestinians, based on the simple declaration that Israel has won. As unconscionable as Pipes’ logic was, a few months later, Congressional Republicans in the U.S. launched the “Israel Victory Caucus.” The co-chair of the Caucus, Rep. Bill Johnson, “predicted” in April 2017 that Trump would soon be heading to Israel to announce the relocation of the U.S. Embassy from Tel Aviv to Jerusalem. Since then, the U.S. is obviously following a blueprint of a strategy in which the U.S. advances Israel’s “victory”, while imposing conditions of surrender on defeated Palestinians. Despite its more diplomatic and legal language, that was also the essence of Oslo. Oslo is not a specific legal document that can be implemented or rejected. It is a spectrum in which the likes of Beilin, Lieberman and Pipes have more in common than they may think; and in which the fate of the Palestinian people is left to inept leaders, incapable of thinking outside the permissible space allocated to them by the Israelis and the Americans. Unfortunately, Abbas and his Authority are still reveling at the expense of the empty space that is Oslo, not the “accords” — provisions, stipulations and heaps of paper — but the corrupt culture— money, perks and unmitigated defeat.